Strength and tone take a lot of hard work, but they don't require you to pull a semi truck with a rope or lift cartoonishly huge weights over your head. Right now, at this very moment, you have everything you need to be strong and chiseled: Your bodyweight. And you didn't even have to pack your gym bag. Push-ups have never gone out of style because they're one of the most dependable tests of relative body strength around -- not to mention their pec-pumping and upper-arm-building action. If you want more out of this dependably no-frills workout, practice a bit of patience and roll with a combo of proper form and exercise variety. If you're not doing push-ups correctly, you won't be reaping the benefits in your pecs, triceps, quads or any other muscle group this classic exercise works. It may sound fundamental, and that's because it is — your form is the foundation on which your results lie. For a basic push-up, keep your hands slightly wider than shoulder width, and pay special attention to keeping your back and neck straight (so your head isn't hanging down) with your hips and torso in-line. Saggy form is one of the most common push-up pitfalls, and it reduces the engagement of stabilizing muscles like the abs and obliques. If you have trouble keeping straight, start with bent-knee push-ups until you can comfortably progress. As you lift your body, focus on putting the weight on the outside of your hands rather than your palms, a habit that can lead to wrist injury. Keep your abs tight as you breathe regularly. To take advantage of the push-up's full range of motion, your chest should graze the floor or come within about an inch of it. If you've already mastered proper form and are pumping out push-ups at a smooth, even tempo with a full range of motion, you're ready to move on to more challenging variations. A simple tweak to your hand spacing can change the target of your workout. Go with a close-grip push-up, placing your hands under your shoulders or just a bit narrower, to heighten the focus on the triceps rather than the chest. Elevate your feet on a bar, bench, step or chair for a decline push-up. The higher the elevation, the greater the challenge and muscle engagement (though lower elevations do a better job working the upper pecs, while higher ones emphasize the fronts of the shoulders). Similarly, putting your hands on an elevated object also increases your push-up's intensity. To safely and gradually ramp things up, start by placing your hands on a stable desk. Once that becomes easy — usually over the course of a few weeks — lower it down to a chair, then a step and then a pair of dumbbells to really boost your burn. Sometimes, you've got to look outside yourself to see within, and that's true for push-ups, too. 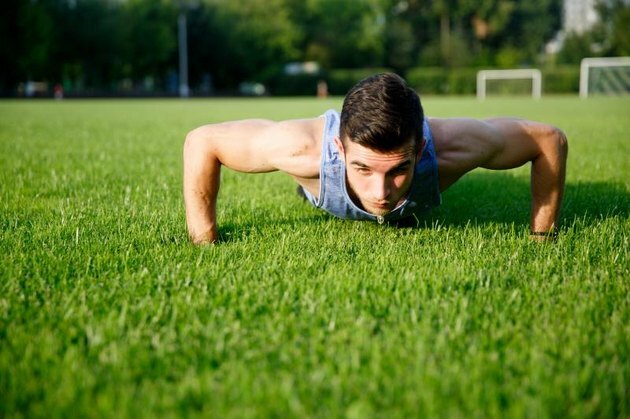 To improve your push-ups over time, you need solid upper-body strength, endurance and body control. And to get that, you need to incorporate the right exercises into your regimen. To help bolster your push-up technique, remember the two "Rs": Rows and resistance. Barbell, cable and dumbbell rows, for instance, are resistance exercises that help work the spinal muscles that stabilize your push-up. Other types of resistance training, whether you prefer free weights or medicine balls, help hone your flexibility, stamina and balance — three keys to better push-ups. Push-ups are one of those exercises that just about every gym junkie has an opinion on, and we want to hear yours. Any tips that have improved your gains? What about variations that you swear by? Push on over to the comments and let us know.